Jaw pain can be debilitating. If you are suffering from pain in your jaw, the first step will need to be identifying the cause. Once we diagnose the source of your pain, we will create a personalized treatment plan to bring you relief. Severe tooth decay can lead to radiating pain or pain deep in the jaw. Removing the decayed tissue and replacing it with a dental filling should eliminate this symptom. Dental trauma can lead to nerve damage, which can cause jaw pain. The treatment may include root canal therapy and a crown for restoration. This type of infection is often marked by deep, throbbing pain, and it needs to be treated with a root canal. If the infection is particularly severe, you may need an extraction. Bruxism is also called teeth grinding. Many people are unaware that they grind their teeth in their sleep until they notice symptoms such as pain in their teeth or jaws. A night guard can prevent the grinding and cushion their teeth. TMJ is a jaw disorder that is marked by pain and dysfunction. A variety of treatments is available to combat this common problem. Although many people try to treat their jaw pain at home, DIY therapies cannot address the underlying cause. Our dentist will use X-rays and other images to diagnose the problem, and we can treat not just the pain, but the issue that is causing your pain. Proper treatment can also stop the spread of any dental disease underlying the discomfort. You can reduce the risk of pain with good dental habits and proper dental care, including regular dental checkups, good dental hygiene, and the use of a mouth guard or night guard, as needed. Jaw pain can keep you from eating a healthy diet. It can interrupt your sleep and complicate your life. Relief is just a phone call away. Schedule your appointment with our dentist today to learn more. 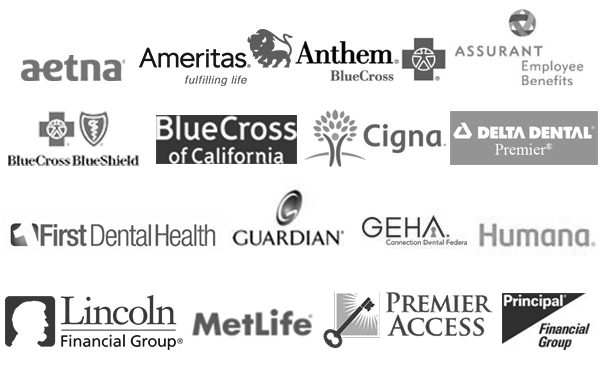 Some of the major insurances we accept are displayed to the right, however, we gladly accept ALL PPO Insurance plans and are a Delta Dental Premier provider. We will gladly help you to understand whether your insurance has limits on the doctors you can see or the services you can receive. If you provide complete and accurate information about your insurance, we will submit claims to your insurance carrier and receive payments for services. Depending on your insurance coverage, you may be responsible for co-payments, co-insurance, or other deductible amounts. Please contact our office or call your insurance carrier should you have any questions. I've been going here since 2010 and I love this dental office! It's very convenient to my residence and they offer an array of services! I'm currently under Invisalign treatment and they gave me a great price! I highly recommend them for any of your dental needs! I really like this dental office, dentists, and staff. The hygienist was very gentle and well mannered, she gave me tips on flossing and brushing properly, I highly recommend them to friends and family..
Now I Can Smile Again! The dentist was very kind + caring. Highly recommend! I only had a few days left on my dental insurance + she helped to prioritize my care + fit me in so that I could get issues taken care of in a pinch. The office manager, couldn't have been sweeter + she helped me to understand the sometimes tricky insurance pieces + actual prices I'd be paying before I made any decisions. A+ experience.